Presenting new opportunities for working on-screen alongside the oculars, 4K digital technology is revolutionizing microscopy cameras. Thanks to a range of advanced technologies, 4K Microscopy cameras clearly reveal the sample’s finest details on-screen, even when zoomed in. Microscope users can now enjoy fast, comfortable and user-friendly on-screen operation – enhancing sample evaluation, facilitating effective collaborations and engaging the audience during presentations. Microscopy has continually advanced and evolved over the years. In fact, we are currently witnessing a particularly interesting time as digital technology is extending the capabilities of imaging and bringing a host of benefits to microscope users. Modern cameras designed to meet these demands are improving all the time, and a huge leap in image quality has recently been achieved with the introduction of 4K digital imaging. Familiar in the context of consumer televisions, 4K UHD (or ultra-high definition) systems include monitors, cameras and software, which have high resolution to provide images both larger and more detailed than previously possible. Complementing the increased resolution, 4K cameras also implement additional technological advances for unprecedented image quality. 4K digital imaging opens the door to a wealth of exciting opportunities in microscopy, enhancing both sample analysis and presentations. When considering on-screen visualization versus observation through the oculars, each has its advantages and limitations. While oculars undoubtedly provide the most life-like view of the sample, working over long time periods can be uncomfortable and slow, and on-screen visualization provides a complementary and comfortable alternative. In fact, 4K Microscopy has now advanced image quality to a standard where the information captured in a digital image rivals that seen through the oculars. Saving time by lessening the need to confirm observations with the oculars, users are increasingly relying on both modes of visualization. While the term 4K describes the image resolution, the benefits of enhanced image quality are also realized through additional digital technologies. These include color reproduction, which has progressed to produce life-like color profiles for accurate analysis, especially when evaluating the subtle hues of histology samples staining. Improvements in noise reduction also allow hidden details to become visible. For example, Olympus Smart Image Averaging (OSIA) completely cancels image noise without reducing the frame rate or introducing artefacts, and without the need of active sensor cooling (Figure 1). Capturing extra details under a variety of imaging conditions makes the camera suitable for many applications that were traditionally the domain of cooled cameras. As such, scientists can now rely on a single camera as a cost-effective alternative to switching to a specialized low-noise camera. In addition to enhancing image quality, digital features also add to the camera’s usability, taking into account the need to quickly navigate to an area of interest and easily bring this into focus. Speed and comfort are especially important when evaluating a high volume of samples each day, and this is facilitated by a fast live image retaining fluid movement during panning, which is ideal when navigating across samples. Moreover, since it can often be of interest to focus on different layers of a tissue sample, continually adjusting the focus to find the desired setting can be time-consuming when analyzing many regions. Time can be saved with a new technology known as Focus Peaking (Figure 2). This function directly highlights all focused areas in the live image, allowing the user to avoid taking multiple snapshots of the same region just to find the required focus. Active noise reduction with Olympus Smart Image Averaging (OSIA) technology makes it possible to capture details that would otherwise be blurred by noise. The scientist can quickly and easily select desired areas to bring into focus, with the Focus Peaking technology (focused areas shown in red) of the Olympus UC90 camera. Successful workflows depend on effective collaborations, which are relied upon on a routine basis to ensure accurate decisionmaking.It therefore follows that efficiently sharing detailed and accurate information between colleagues is vital. With its higher resolution combined with a large field of view, 4K Microscopy facilitates joint image evaluations, also enhancing presentations as structures are displayed on-screen both in detail and in context. 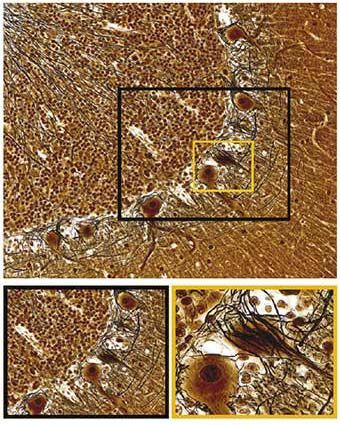 As shown in Figure 3, large images such as a section of brain tissue provide a representative sample view with the complex tissue architecture visible. At the same time the details captured with 4K resolution allow this image to be magnified, revealing additional details of the neuronal morphology for analysis and discussions at both the tissue and cellular level. This expanse of information presented to multiple scientists allows the complete team to gain a thorough understanding of the study via the on-screen image. For the analysis of even larger regions, digital image stitching can further expand the field of view, merging many acquisitions from multiple sample regions into a single high-quality brightfield panoramic image. 4K Microscopy makes this process faster, requiring far fewer single acquisitions to form the final panoramic image. Through these capabilities, the life-like images acquired with 4K microscopy also enables scientists to display results in their best light during presentations at conferences or during teaching sessions, engaging the whole audience. Many scenarios exist where this can be beneficial, such as when a university lecturer is employing a live image feed from the microscope during a seminar. As the presenter pans across the sample and zooms in to display the finer details on a large screen, fast imaging delivers fluid navigation that quickly displays the area of interest for the audience. In contrast to the use of multi-headed microscopes for example in a teaching setting, a large group of scientists can easily view and discuss the sample with clarity and understanding, with simply a standard microscope fitted with a 4K camera and a large 4K screen. For a fuller understanding, a large field of view allows samples to be analyzed in context in a single image, while high-resolution allows zooming in to reveal the most detailed structures. This is enabled by the 1-inch, 9 megapixel CCD of the Olympus UC90 camera. Digital imaging technologies have now advanced to a level where samples can be analyzed via the monitor with accuracy and confidence. With the latest 4K Microscopy cameras such as the Olympus UC90, increased resolution and field of view is combined with cutting-edge digital capabilities for insightful analysis and clear communication. In addition to enhanced on-screen image quality, time is saved through fast live imaging and fast focusing, while observations can be confirmed directly onscreen, with only the occasional glance through the oculars needed. In the 4K microscopy era, images are truly coming to life for microscope users to explore their samples like never before.